Sappington-Concord Historical Society sponsors a variety of events for its members and the public. Some are held on a regular basis and some are special one-time events. SCHS has several types of programs. The one program with a set schedule that never changes is the SCHS general meetings held quarterly on the fourth Wednesday of January, April, July and October. The following is a list of all up-coming events in chronological order. January 1, 2016 Note, this event is over, held in 2016. Thank you for your membership in SCHS in 2015. In addition to receiving this fine newsletter four times a year and helping make possible the annual Memorial Day ceremony and many history-related presentations and tours, you know that understanding more about our history makes for better understanding of ourselves and stronger communities. Besides that, history is interesting! Please continue your support of SCHS by renewing your dues for 2016. Welcome to the new year and may it be a happy and prosperous one for you and your family. See the Joining page for more info on dues, how to make out the check and where to send it. January 21, 2016, Thursday 2:30 pm Note, this event is over, held in 2016. “The Underground Railroad; Conductors and Stationmasters” by Steve Edison of the Abolition News Network, an organization that produces video interviews of historic figures in the TV news interview style. In his presentation, Steve will describe how the underground railroad was operated by conductors and stationmasters, and will present one example of each. He will show video interviews with each of these two historic figures who helped slaves get from the American south to Canada. See the videos on the Underground Railroad that Steve will use to illustrate his talk on Thursday. January 27, 2016, Wednesday, 7:00 pm Note, this event is over, held in 2016. February 3, 2016, Wednesday, 11:00 am Note, this event is over, held in 2016. 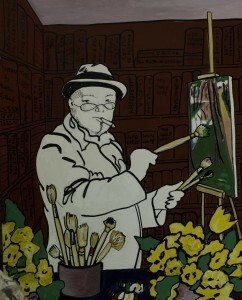 Winter Meet-at-the-Site Tour to Kemper Art Museum at Washington University to see the exhibit of Winston Churchill paintings. Meet at the main entrance to the museum if driving yourself. If driving with friends, meet at St Lucas UCC church at 10:00 am and depart at 10:15 am. Park on east parking lot at the north end away from other cars. Entrance to Kemper Museum and Churchill exhibit is free. We need a minimum of 10 for our guided tour. Call Stephen Hanpeter to sign up, 314-918-1617. Leave a message please, clearly stating your name and phone number. Get details on the February 3rd Meet-at-the-Site Tour. See page about Meet-at-the-Site Tours. See map to St Lucas UCC church for car pool location. February 3 and 10, 2016 Note, this event is over, held in 2016. Mini workshop on Facebook and how to use it for local history. Workshop in two sessions. Do you use a computer, but not Facebook? Do you think that Facebook is a waste of time, or feel it is scary? Come find out what Facebook is all about and see what it can do for you. How difficult is Facebook, you might ask. You can probably handle Facebook if you know how to use email and you can search the internet. Facebook can give your interest in history a powerful boost. If you use a laptop computer, bring it with you. Sign up at January 27 general meeting or call Stephen Hanpeter at 314-918-1617 to leave a message, or email schs.webmanager@gmail.com. Seating limited to ten people. Session I, Intro to Facebook, is what Facebook can do for you and how to do it. Session II, Facebook Followup, is a follow up to share problems and successes. Please choose either the two night time sessions that meet at Lindbergh High School, or the two day time sessions that meet at the Library Americana at Sappington House. The content is the same for the daytime and night time sessions. Night time sessions meet at Lindbergh High School in PD South, the old board room- Session I, Intro to Facebook, Wednesday, February 3, 7:00 to 9:00 pm, Session II, Facebook Followup, Wednesday, February 10, 7:00 to 9:00 pm. Day time sessions at Library of Americana at Sappington House – Session I, Intro to Facebook, Friday, February 5, 1:00 to 3:00 pm, Session II, Facebook Followup, Friday, February 12, 1:00 to 2:00 pm. An additional session will be held Friday, Feb 19 1:00 to 3:00 pm at the Library Americana, on Social networking. February 18, 2016, Thursday 2:30 pm Note, this event is over, held in 2016. “The History of the Muny Opera” by Laura Peters, for 22 years the Marketing Director for The Muny, is currently its official Archivist and Historian. She is charged with compiling The Muny’s History…from Archibald Leach (Cary Grant) to Flo Ziegfeld! Laura has designed a presentation, outlining that fascinating and glamorous history, and will bring that to Friendship Village on February 18. We invite you to join us with your own stories, and Laura will be happy to tell you everything you ever wanted to know about America’s oldest and largest outdoor musical theatre! February 26, 2016, Friday 1:00 pm to 3:00 pm, this event includes two parts; tour and presentation. Note, this event is over, held in 2016. 1:00 pm – Light refreshments and tour of the new facilities at Grant’s View branch including study rooms, larger meeting rooms, more seating, improved children’s room among other new features. See drawings and descriptions of the facilities at Grant’s View web page. 2:00 pm – Presentation “St. Louis Freedom Struggle 1821-1968” by Gwen Moore, curator at the Missouri History Museum. St. Louis played a leading role in the battle for fair and equitable treatment, a role that is generally under-appreciated. This presentation will focus on two periods: before Brown v. Board of Education (1821–1954) and the modern Civil Rights Movement (1954–1968). There will be a tour of the new library and facilities before the presentation at 1:00 pm. Get directions to Grant’s View Library. Grant’s View opening date announced; December 22, 2015 Note, this event is over, held in 2016. March 31, 2016, Thursday 2:30 pm Note, this event is over, held in 2016. Beer making has been part of the St. Louis scene since mid-1800. The city became a leader in beer production because of our location, lots of clean water, an unique cave system used to lager the beer and a heavy migration of Germans whom helped make as well as consume the product. Over 60 Beer Barons are buried at Bellefontaine. Our presentation will focus on eleven of the more provocative Barons. Some that are well known include: Busch, Anheuser, and Lemp, and some less well known like Max Feuerbacher and William Nolker. April 21, 2016, Thursday 2:30 pm Note, this event is over, held in 2016. “Ethnic St. Louis,” by Elizabeth Terry with co-authors, John A. Wright and Patrick McCarthy. They will speak on their new book, Ethnic St. Louis. See more at: Elizabeth Terry et al to speak on their new book Ethnic St. Louis. April 27, 2016, Wednesday, 7:00 pm Note, this event is over, held in 2016. SCHS General Meeting with presentation at Sperreng Middle School, 12111 Tesson Ferry Rd. 63128. The meeting will be in the spacious cafeteria, easily accessible from the parking lot and there is plenty of handicap parking nearby. “The History of the Missouri Botanical Garden” by Jack Lane of the Missouri Botanical Garden Master Gardeners Speakers Bureau. Enjoy a history lesson on the growth and development of MBG. From Henry Shaw to Dr. Peter Raven, the program details the parallel growth of St. Louis city and the Botanical Garden. It starts with young Henry Shaw and includes many archival photos and maps. See directions to Sperreng Middle School. May 6, 2016, Friday 2:00 pm at Grant’s View library Note, this event is over, held in 2016. Presentation “St. Louis Freedom Struggle 1921-1968, Part Two” by Gwen Moore, curator at the Missouri History Museum. St. Louis played a leading role in the battle for fair and equitable treatment, a role that is generally under-appreciated. Part one of the presentation focused on the period from 1821 to 1918. Part two will focus on the period 1918 to 1968 including Brown v. Board of Education in 1954 and the modern Civil Rights Movement, 1954–1968. May 11, 2016, Wednesday 10:00 am Note, this event is over, held in 2016. Meet at the Missouri Botanical Garden main entrance in front of the ticket counters if driving yourself. If driving with friends, meet at St Lucas UCC church at 9:00 am and depart at 9:15 am. Park on east parking lot at the north end away from the other cars. Entering the Missouri Botanical Garden will be free of charge on that Wednesday morning for residents of St Louis City and St Louis County having identification showing their residency. Riding on the tram is $4.00 for a 30 minute narrated tour. If you are interested in riding, the tram tours run from 10-4:00 on the hour every hour, Mon to Friday. Sign up for this Meet-at-the-Site Tour, free for City and County residents at the April 27 general meeting. See map to St Lucas UCC church for people riding together to meet. May 19, 2016, Thursday 2:30 pm Note, this event is over, held in 2016. “Forest Park from a Gardener’s Perspective” by Jack Lane of the Missouri Botanical Garden Master Gardeners Speakers Bureau. Jack’s talk presents a history of Forest Park from the region’s shaping by glaciers to the present landscape renovation efforts on Government Hill, Pagoda Circle. Starting with the glacial impact on this region’s topography, the program covers many decades from the park’s establishment, the 1904 World’s Fair, the mid 20th century decline and the current, landscape renovation efforts. The program includes archival photo’s that have been gathered from several sources. May 30, 2016, Monday 10:00 am ceremony, 11:15 am reception Note, this event is over, held in 2016. See directions to the green at St Lucas and photos of ceremony last year and more info about this year’s ceremony. See note about remembering the late Patriot Guard, Mark Schoeder, in the Memorial Day ceremony. See photos of 2016 SCHS Memorial Day ceremony on the green at St Lucas. June 1-11, 2016, Tuesdays to Saturdays, probably 9:00 am to 5:00 pm, depending on the weather. Note, this event is over, held in 2016. The Dig at Sappington House, an archaeological dig for high school students. Please come to watch and enjoy the fun, fascination! Bring your lawn chairs. See more information about the Dig at Sappington House. June 30, 2016, Thursday 2:30 pm Note, this event is over, held in 2016. “The Battle of the Bulge” by Gene Ganz of the Battle of the Bulge group in South St Louis County, will speak on the Battle of the Bulge and his experience fighting in the battle until he was wounded. Gene was in the first infantry division serving in Belgium and Germany. Gene’s wife, Bobbie, will speak about the home front and her work producing Air Force wings pins. Gene will illustrate his talk with maps and a few military items. July 27, 2016, Wednesday, 7:00 pm, Note, this event is over, held in 2016. “Route 66 in St. Louis” by Joe Sonderman The presentation will explain the different alignments (routes), landmarks, and businesses along the way in St Louis on Route 66. • Bring your own Route 66 memorabilia and photos for the members Route 66 display table. Wear your Route 66 garb. Share your Route 66 stories and memories. • Dan Gonzales, St Louis County Preservation Historian, will be at the meeting to represent the effort to save the bridge which crosses the Meramec in Route 66 State Park. August 3, 2016, Wednesday 10:00 am Note, this event is over, held in 2016. Meet at the museum in front of the Thomas Jefferson statue if driving yourself. If driving with friends, meet at St Lucas UCC church at 9:00 am and depart at 9:15 am. Park on east parking lot at the north end away from the other cars. the museum is free of charge. Sign up for this Meet-at-the-Site Tour at the July 27 general meeting. See map to St Lucas UCC church for people riding together to the museum. August 18, 2016, Thursday 2:30 pm Note, this event is over, held in 2016. “Historic Sites of St. Louis County Parks” by Daniel Gonzales, St. Louis County Historian. The talk explores the 16 historic sites contained within the St. Louis County Parks system including well known ones like the Museum of Transportation, Laumeier Sculpture Park, and Jefferson Barracks, as well as some lesser known gems like St. Stanislaus Park, the Nims Mansion, and Sioux Passage. September 9, 2016, Friday, 2:00 pm Note, this event is over, held in 2016. This unique talk will include a variety of amazing topics including the world’s strangest love story, the funniest and most fascinating man in baseball, and the greatest art hoax ever perpetrated (it even fooled Hitler). Other subjects include the sad, strange fate of wealthy recluse brothers who seemed to have it all. There is something for everyone in this unusual medley of weird and unusual stories. Sept 15, 2016, Thursday 2:30 pm Note, this event is over, held in 2016. “The Archaeological Dig at Sappington House” by Stephen Hanpeter. A report on the dig in June 2016 for high school students. October 27, 2016, Thursday, 7:00 pm Note, this event is over, held in 2016. See evening agenda below. Please note that the date for this event is on a different night from our usual fourth Wednesday of the month. This SCHS general meeting will be held on a Thursday night. Notice the venue will be at the Sperreng Middle School cafeteria on Tesson Ferry Road at Concord School Road. See directions to Sperreng Middle School. The topic will be, “James Audubon and the Birds of America” by Tom Reh of the Mercantile Library. Tom’s talk will illustrate the life and times of James Audubon with examples of his most famous work, The Birds of America. Audubon remains the premier ornithological artist in the world and has a St. Louis connection! Tom will also briefly describe the exhibit at the Mercantile Library which SCHS members will visit on Saturday, October 29. The exhibit features illustrations by James Audubon among other works of natural history. 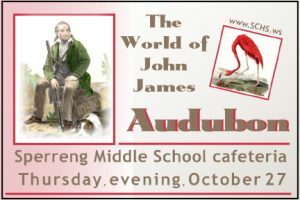 See more about the presentation and the topic on the page about Audubon presentation and tour of Audubon exhibit. Doors open at 6:30 pm for members and visitors to see displays and to meet the speaker for the evening. There will be a brief business meeting at 7:00 pm finishing about 7:20, then refreshments are served followed by the presentation on Audubon. Doors close at 9:00 pm. Note, this event is over, held in 2016. 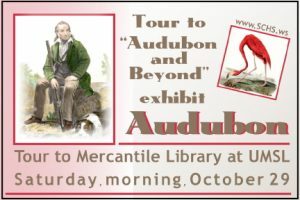 Fall Meet-at-the-Site Tour to the Mercantile Library at UMSL to see the exhibit, “Audubon and Beyond: Collecting Five Centuries of Natural History at the St. Louis Mercantile Library.” Sign up for this Meet-at-the-Site Tour at the October 27 general meeting. Tom Reh will lead the tour. Meet at the Mercantile Library circulation desk at 10:00 am. Parking is on the third floor of the parking garage next to the Mercantile Library on the UMSL campus. See more about the tour on the page about Audubon presentation and tour of Audubon exhibit. Nov 3, 2016, Thursday 2:30 pm Note, this event is over, held in 2016. “100 Years of Glorious National Parks” by David Newman of the US Grant Historic Site at White Haven. How did our national parks come to be and what do they mean to us as Americans? How are our parks managed? Who uses them? How do national parks and historic sites differ? Get the answers to these and any other questions you may have from David Newman. November 20, 2016, Sunday at 2:00 pm Note, this event is over, held in 2016. Reports on the archaeological dig at Sappington House by the students; their experiences and their findings. Seating limited to 70 people. Reserve your seats by emailing Stephen Hanpeter at schs.webmanager@gmail.com or call 314-918-1617. See more about the presentations. December 1, 2016, Thursday at 2:30 pm Note, this event is over, held in 2016. “Virtual Video Tour of the Thomas Sappington House” created by and presented by Ray Hoffstetter, professional TV cameraman and long time Sappington House board member. Take the virtual tour of this historic gem right in the Crestview neighborhood.